For some reason, we had two bins of arugula and spinach mix languishing in the fridge. I think perhaps it was supposed to be used for a gathering, but obviously never was. In any case, we didn't think we could eat all that as "salads", especially since their demise seemed fast-approaching, so we had to think of a way to use up the whole bunch quickly. Why not a pesto? That definitely needs a whackload of greens. No recipe here. I simply buzzed together the arugula and spinach with a lot of garlic, some lemon juice, salt, and extra-virgin olive oil. I added some pine nuts as well. For some reason, I reached for the blender instead of the food processor, resulting in a very smooth pesto (instead of the usual pesto texture I'm used to). But, it wasn't bad at all and it grew on me. Who can resist its electric green color? 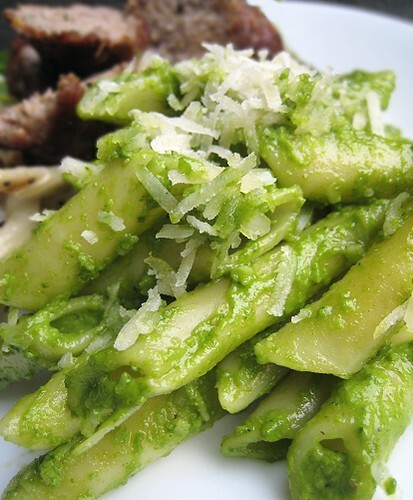 I tossed some penne with the arugula spinach pesto, and topped it with some grated Parmigiano Reggiano. Perfect for a light meal. But as you know, light meals seem to be impossible in our household. So, lookee there in the background. What is that? That post is coming up next. I love using greens for pesto when my basil stash is low! Looks great! I love the vibrant green colour. Yum! 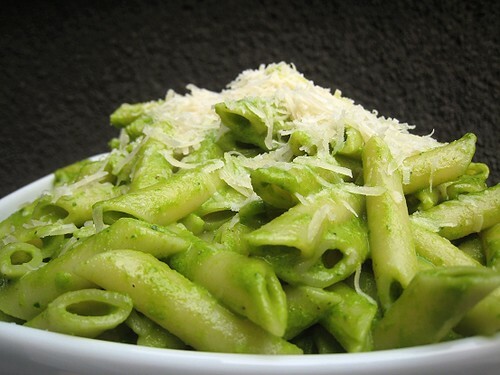 Pesto pasta is my hubby's favourite. The Parmigiano Reggiano on top makes the dish more appetizing! Luv it! Oh, and the green? Loving it. I have affectionately renamed this, "Incredible Hulk Penne". 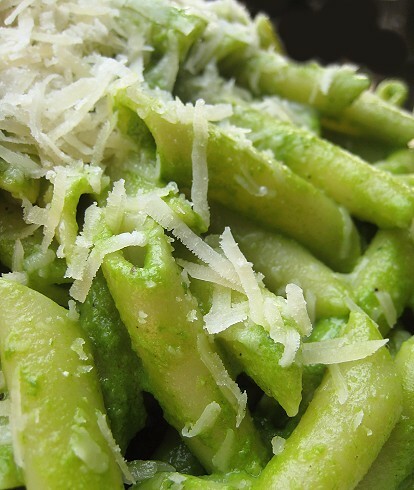 I adore arugula and frankly have never thought of making a pesto with it. Thanks for the inspiration, I am going to get some next weekend and make this. both of you eats good everyday, i don't have the energy to cook but would love to eat anything. what a lovely green colour! I was a little surprised at the color that came out! Wonder if he'll like an arugula pesto! Oh, I love that name! Haha. Ooh, nice. I wonder if it's going to be better roughly processed, or processed into a smooth "pesto."